BANGI, 4 September 2014 – The 4000 odd new students of The National University of Malaysia (UKM) have been urged to help make it among the top ten universities in the world. Vice-Chancellor Professor Dato’ Dr Noor Azlan Ghazali gave them the challenge when addressing the new students just before their oath-taking ceremony here today as part of their orientation week programme. Prof Noor Azlan said UKM has already been making waves at home and abroad and it would not be impossible for the university to be ranked among the top ten of the world. Currently UKM is ranked 19th in the world for universities of less than fifty years. He called on them to stand out from the rest, to be innovative and become Guardians Of the Nation. “We are investing in you. We will be meeting you over and over again,” he said. 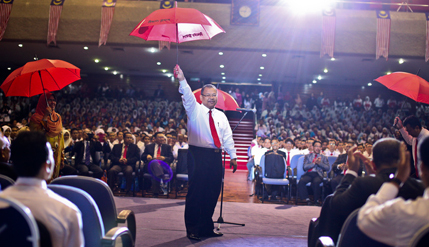 Comparing the trait of standing out from the rest to that of a red umbrella, he said students needed to be team players and have the entrepreneurial spirit to raise the profile of UKM. They have three or four years to become better than the undergraduates of other universities and learn to serve the nation in whatever way with their talents. Describing them as partners, he said they must do more than just attend lectures and earn degrees at the end of their studies. He expects them to excel in studies and be innovative, adding that classroom work alone is not enough, as knowledge and competency comes from other activities. He said UKM and the country need young people with a nationalistic zeal who can come up with high-impact innovations and think at the strategic level. They should also be able to negotiate smart partnerships at home and abroad and thus becoming good envoys of Malaysia. Prof Noor Azlan said characteristics of the UKM students are embodied in the university’s Strategic Key Results Areas (SKRA) which are in line with Malaysia’s National Key Results Areas. But in the quest to achieve the red umbrella status, they should always be mindful of their honour when competing and should always be ethical to protect the integrity of the university and country. The student were also introduced to six UKM undergraduates who had excelled in their fields or became pioneers in new ventures at home and abroad. Their achievements were in fields as diverse as driving Fuel Cell cars in Manila, to speaking at an International Law Conference in Paris, Cricket championships to Youth Volunteerism in ASEAN countries.